The new wall drain for showers made of Miraklon® is a discreetly beautiful alternative to the usual floor drains. The drain set and the sewage pipe are installed in the wall. Compared to the usual wall drain systems, the complete water-bearing level of the variant of Hasenkopf is produced in one material and one cast. Thanks to the removable cover, the wall drain can be easily cleaned. An optimized construction with very thin seams allow the clean design to merge an "one piece" product appearance. The Miraklon® wall drain shows in a perfect way how Hasenkopf differentiate from its competitors through its functional design approach. The special designed and developed Miraklon® wall drain is a wall mounted drain fitting covered by a even solid surface cover. The construction enables a durable and hygienic use with a nearly invisible drain placement in the shower tray system. The removable drain cover provides due to the inner coves an easy regularly cleaning. The drain orifice sticks to the wall by means of embedded magnets. Hasenkopf sells the wall drain with an included opener for an easy opening. The all new wall drain system is suitable for drain fittings with 90 mm diameter as standard (e.g. Geberit Uniflex D90). 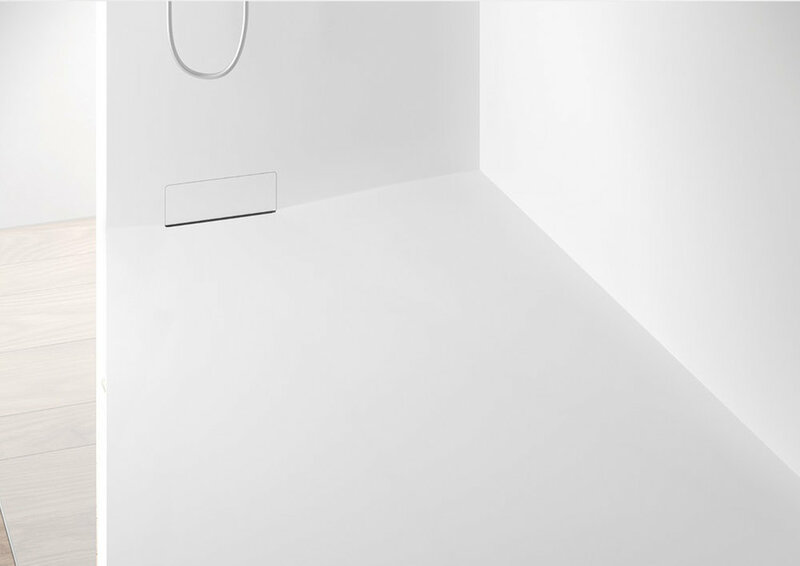 Like all Hasenkopf shower trays, a minimum depth of 63 mm is needed to require a floor level installation.